Pearla shows us her mansion, pulls back the covers and reveals the long history of her family. Starting at something close to 800 AD after one of her husband’s sires was rewarded a parcel of land in Tuscany after leal service as a soldier to the pope. We visit the old kitchen, the new kitchen, the dining room, common room and even the chapel. We see the graves of those long dead, read letters from passing workers promising duels upon their return to the estate and are privileged to a thousand other tidbits that make up this rich tapestry. It is in this unique window that I come to appreciate the long history of the region. It is made all the more precious as so few have seen it. This is no museum on public display, thousand-thousand eyes have not pried here each taking a piece. No, this is unique – thank you, Pearla. We have another long drive ahead to Venice. Looking in the rearview mirror I’m sad to see the hills of Tuscany fade away. The easing slopes covered in vineyards and conifers slowly disappear from view and as we join the highway we move on already forgetting, already turning the moments into memories. I want to write about how romantic Venice is. How its canal’s and beauty stole my breath and loosed my imagination, but I can’t. I have seen Venice, I wandered its streets with the masses and can say only this – I understand its exodus and am sorry to have contributed to it. It was beautiful but overused, its soul fractured, its essence displaced, the barest notes of its once splendid music barely stirring in the summer’s stillness. We avoided St Marco Piazza in favour of the twisted alleys, ate a gelato, dined out one night and moved on. 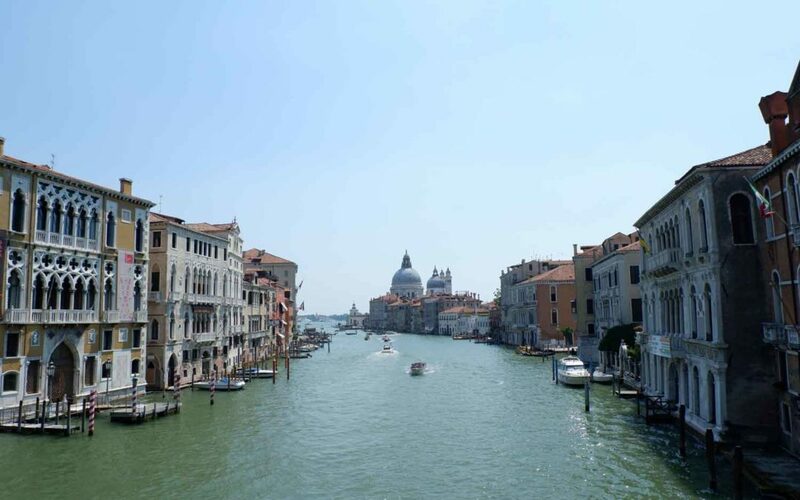 So, I have seen Venice, gotten lost in its mazes and canals. I mean it no disrespect and have probably upset scores of people but there you have it. We arrange a last minute three-night stay at Tuscany that would have otherwise been spent in Monte Rosso. Our accommodation is in a large Tuscan mansion that has been owned by one family since the 1500’s. Our host Pearla seems warm and wonderful over the phone but we’ve become sceptical. Somehow since arriving in Italy, we’ve realised that we are over halfway through our journey, torn between making the most of it and looking forward to the familiar. Pearla is as amazing as she seems, motherly almost. Imagine the famed Italian mamma greeting in you the in the warmth of a Tuscan summer’s evening and abundance of Wine and home cooked food following in her wake. Her exclamation and fussing of Willow, her seemingly endless smile and good nature envelop us. 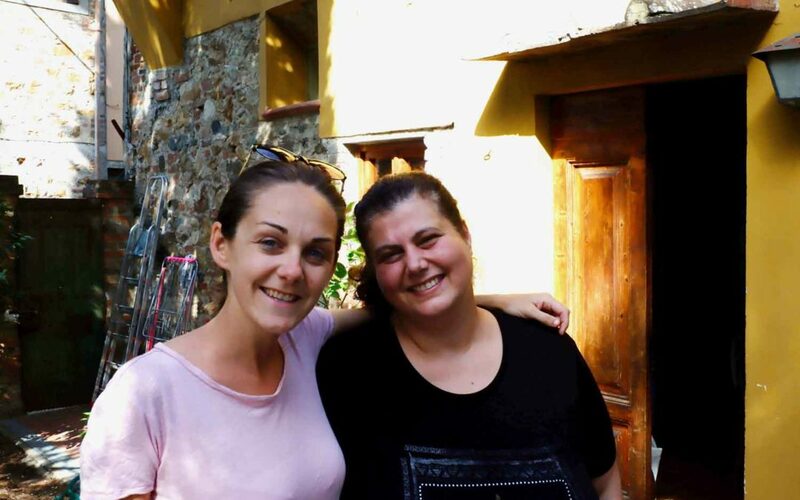 Here is the Italy that we wanted, the famed hospitality and warmth that turns it around for us. We go to bed tired, full, comfortable and eagerly awaiting tomorrow. Florence is a romantic city, the home of the Renaissance. We set to it catching a bus from our village of Impruneta. One line, a scant few stops we’re comforted by the simplicity of the trip compared to some of our other public transport mishaps. We arrive by the remnants of the old wall of Florence and begin. A simple breakfast for Willow and Sandi of pastries (you wouldn’t believe how many pastries, croissants and gelato my girls have eaten this trip) and we head off. Walking has become a lot easier, we’ve done so much of it. We walk into the centre of Florence, we visit the Florence Cathedral. Sandi and I run through the Medici family history and like all old cities our minds wander the history of the place as our feet walk on its contemporary ground. It is hot today and we have walked far. We head back towards the bus stop and explore the Medici gardens on the way, it is the afternoon the city a haze in the background silenced by the gardens. Slowly the romance and history of Florence fades away and we head back to our accommodation. We head to Sienna. Greeted by the influx of tourists in peak season and the hottest day in summer I can’t enjoy it. I becoming jaded I’m aware, I remind myself that each moment is precious and will soon be gone and it is unlikely that we will return anytime soon. But, I can’t bully myself into it, despite the beauty of Sienna it becomes more of the same. Sandi is in a similar frame of mind so, we leave. We both need the rest, only Willow seems boundless in her enthusiasm. 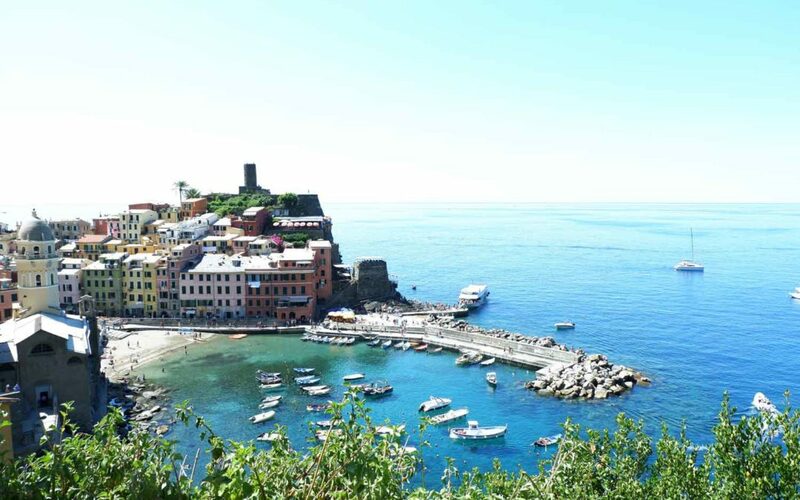 We stay at Monterosso al Mare, one of the five towns hugging the coastline that makes up Cinque Terre. It is beautiful but overwhelming, stunning but overused. Overloved, over enjoyed, over consumed, worn, fatigued, tired. The price of tourism is often the authenticity of the experience and so it was. The warming Italian experience that we were hoping for is disappointingly not here. Instead of familiar accents fill the air, the hospitality is as short and sharp as a cracked whipped, the people tired fed up with this annual invasion of which we belong. I won’t dwell on it, in retrospect we came at the wrong time. We arrive for noise, frustration, swarms of people and…well, the substandard version of our accommodation rather than the ‘serving suggestion’ we were shown. It became negative quickly, the first really bad experience of our travel that has us homesick. 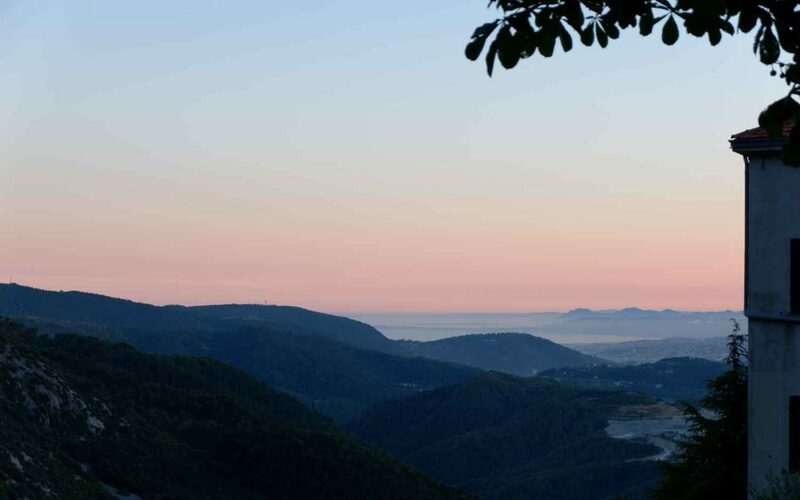 So, we tick a few items off our list of must do’s, pack our bags, retrieve our car from parking and head to Tuscany leaving this overpriced cacophony of beautiful but shallow inauthenticity in our wake. …It’s not that bad, it may not be that good. I can’t hope to tell you, I haven’t the wit or skill to capture it in words. I loved the place and hated it, sometimes in the span of one breath. Perhaps it’s best to put it like this, I left Morrocco with the utmost gratitude for my home soil and also eagerly look forward to returning. Such is the division, the contradiction and the magic of Morrocco. Day 15 – Arrival, Our Riad, the twisted alleys of the old city. 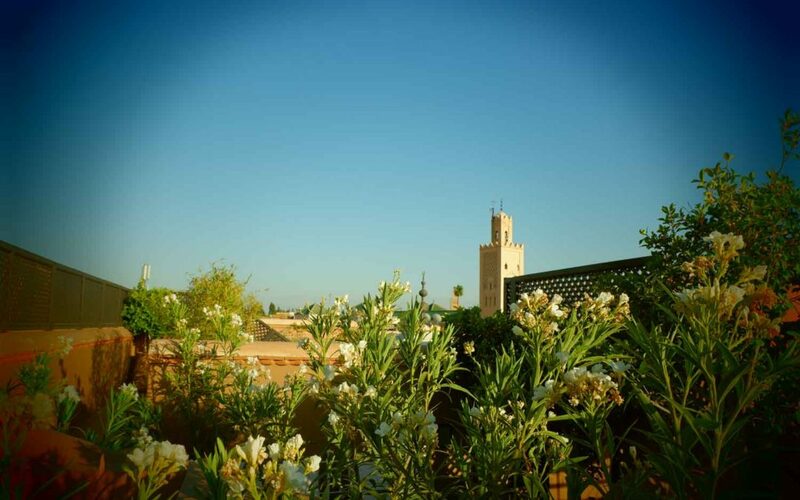 Tired from yesterday, an early flight and poor sleep we arrive at our Riad. We’re offered breakfast and fall upon it. Sipping the sweetened mint tea with pastry’s, fresh fruit and yoghurt. The French influence in Morroco is indeed palatable. After our introduction with our host and Riad owner Alexandria, we are shown our room. We plan a brief sleep but awake some 5 hours later, rested and eager to explore. We head into the Souks. It’s been a long-awaited highlight of Sandi’s and so she heads of eagerly. It is a jungle in the Souks. Winding alleyway’s, racing mopeds, donkey’s, the constant singing of stall holders as they try to lure your attention. In many ways it’s overwhelming, in other ways it’s such a significant difference from our own culture that it becomes enchanting. We soon get distracted by the displays of some stall holders and lose our way. As we wander in hope there is a growing sense of angst. Marrakesh is huge it’s the streets of the old city are numerous, winding, misleading and deceptive my phone internet is not working so we have no interactive map and with the myriad streets and high up names, it’s all but impossible to use the map the Riad gave us. Sandi approaches some women and they very kindly offer to lead us back to our Riad. We try to pay them as we’ve read up on this, but they refuse. It strikes me as a great kindness, they look Willow in the eye’s and exclaim how beautiful she is before they part and I’m thankful. Back in our Riad we wash the misadventure off in the swimming pools, try our first authentic Tagine of Lamb and date and though I’m speculative that we’ll sleep again we doze off easily and don’t wake till morning. The next two days blur together, I get a crash course in the various tribes of Morrocco and the small intricacies of their crafts that define them; colour, pattern, materials, Sahara, Berber, Blue man… my head whirls with the variants. We go a little crazy with our shopping and Sandi takes to bartering like a duck to water. First price, best price, back and forth giving inches and hoping for miles. After each ‘bargain’ Sandi consults either Google or our host Alexandria to see if she secured a ‘bargain’. Sandi is either bitterly disappointed when it proves not to be the case or elated when it does. Indeed she almost see’s it is a challenge for the next ‘item’. Soon her steely, blue gaze meets the stall holder’s and they back down easier. She joins the great game of it and I feel is a little intoxicated by it. Leather bags, a jacket for myself, a large carpet, a light shade of significant beauty, small treasures, intricate wood pieces, keepsakes and gifts – first price, best price, servings of mint-tea the whole process unfolding. It becomes like flirting, like a strange dance neither side willing to reveal more than the other. My father travelled extensively throughout the middle east in his youth. He tried to teach bartering but it was largely wasted on me and now here in this place surrounded by this noise, this strange dancing of conversations the feints of interest and disinterest it makes sense. After one handshake and ‘deal’ Sandi has to take a moped to the teller machine. Sitting on the back of the moped she’s whizzed through the narrow alleyways of the old city, knees shyly missing the carts and crowds. I’m told 20 minutes at the 15 minutes mark I’ve rehearsed the lines of Taken and moved onto the 60-minute interview where I explain why I thought it was a good idea at the time to let my wife disappear on a moped. I’m at the last chapter of this twisted fantasy, about the part where I find her as a 60-year-old woman and trade her for three goats and a shrubbery before she walks through the door all smiles and Dirham. I realise that much of the paranoia stems from misunderstanding, fear and narrow-mindedness and I remind myself of a universal truth I learnt years ago when I first travelled – People are people everywhere, the good the bad and the indifferent. Despite Sandi’s ardour to continue to venture into the Souks’ Willow and I are eager to see other aspects of this wondrous, alien destination. We’ve organised a trip to venture into the Atlas Mountains. Our trip starts after breakfast. Heading out through the city you not only become aware of the contrast between the old and new city’s but also the rich-poor divide. The shadow’s of mega-malls lie over the incomplete husks of abandoned housing estates, Mercedes queue at lights with rusted bombs and everywhere the buzz of scooter-bikes zipping between lanes then clinging to the side of the road as the traffic moves at pace. As the city fades away the dryness of Morrocco starts to unveil, the cityscape gives way to an arid landscape broken by a contrasting sliver of green. It is this green sliver we follow into the Atlas mountains and the home of the Berber people of Morrocco. We leave the car once to see argon nuts being harvested for their oil, we’re asked by two small boys for money, we only have larger Dirham notes Sandi finds some middle ground and passes on some strawberry chewing gum – they seem thrilled with the offering. The next time we leave the car is because the road has ended. We’re handed over to our walking guide Ahmed, he will take us on a hike into the mountains. Ahmed tells us that the road was completed 25 years ago, that his village is the closest to it and that for the rest of the Berber villages it is a 4-hour to 4-day hike to end of the road which they use for trade. Walking up into the mountains following the stream, listening to the sigh of willow trees and surrounded by lush green it’s easy to forget you are in a dry arid moonscape until you rise above the valley. We rest once at a precarious cafe perched on a cliff face before heading an easier route down. Sandi buys another rug on the way down, her steely gaze off-putting the salesman a little, perhaps enough to get ‘best price’. We lunch in a stream, yes in a stream, the table and chairs sit in the cool stream like a primitive air-conditioning system and beat the day’s heat. We order the Tagines. The drive back takes hours and hours, we’re told we will visit a lake. It is on this drive we see the sparseness of the desert, it’s vastness is an unforgiving abyss that in lieu of, or perhaps in spite of, still supports life. Livestock grazes among the dust and rocks, shepherd’s watch their flocks as their forefathers have done for aeons. I try to shake the almost prophetic vision of the world in drought and the chilling apocalyptic nature of the landscape. Looking into the bleak landscape it’s easy to understand why so many religions come from such places. The horizon staring back remorseless, apathetic to your existence. The idea of paradise after such nothingness has its appeal. A life of sacrifice and hardship rewarded with the gifts of excess. The car ride is silent as the sparseness fills our minds. I’m glad I’m visiting, I can imagine no life for myself here. The lake is huge, our driver makes the joke that it is the beach of Marrakesh, we spend mere moments at its shore. A man is praying facing Mecca he’s life’s worth in bags scattered around him, on the water jet skis power of the surface of the lake an elaborate decadence of the rich. It is a land of contrast and divides. We return to our Riad and I eagerly wash the day’s dust off in the pool grateful, ever so grateful for my life and the opportunities of my country. We leave Morroco early, the street cool from the desert night the stall holders absent, the place is still, devoid of life – eerie. We fly out back to Spain, to green, oceans and the familar. We grab the car and begin our journey to Italy.